The Space Shuttle fleet set high marks of achievement and endurance through 30 years of missions, from its first, when STS-1 launched on April 12, 1981, to its last, when STS-135 landed on July 21, 2011. 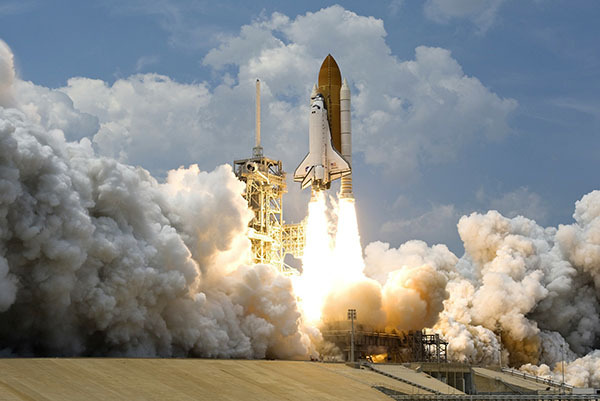 When Atlantis lifted off from its launchpad on July 8, 2011, it marked the end of an era. The 30-year space shuttle program is now over. Never again will we thrill at the sight of the planet’s first winged spacecraft affixed to an external tank with two solid rocket boosters (in what became an iconic shape for our generation) blast off in billows of smoke and fire. And never were nature travels—for the astronauts or for us—more exciting! NASA is saying that it will focus on missions to Mars next; however, robots may be the new astronauts. But the thought of having no human beings stepping again onto pristine, natural, new worlds in our lifetimes is sobering. On the bright side, though, perhaps the robots will do a better job than we have of leaving no carbon footprint in the places where they wander. For now, let’s just watch Atlantis’s historic launch, one more time. My wife and I were living in a small village on Mallorca (Majorca) the night of the first moon landing. We gathered with other folks around an amateur astronomer with a big telescope who hoped to see something. He didn’t, but on the news of the landing, many in the crowd came up to my wife and me, shaking our hands and extending congratulations to us as the only representative Americans in the crowd. We’ll certainly never forget July 20, 1969. NASA’s program may be over, but I think we’re going to start seeing more private enterprises into the great unknown. I’m curious, (and a little apprehensive) to see what new opportunities arise. It’s in our nature to explore — we haven’t seen the last of the manned shuttles yet. But what will happen to the international space station? In a way I am glad it is over, if we were to think of the billions wasted on space exploration. When we still don’t even know much of anything about the oceans that we seem to have turned into our personal dumping grounds. Jacques Cousteau and the Calypso were really the last explorers of the oceans, thankfully his son has carried on the family tradition. We should learn and explore all that we can about the oceans without it all being about profit ( treasure hunters). In a few years we will be able to combine space and ocean exploration when Russia allows the space station to come crashing down. Wow, ya. Really hard to believe its all over.